I FOUGHT MY OWN BATTLE AGAINST AML, the freight-train of leukemia. In the summer of 2017, I spent more than four months at MSK, two rounds of chemotherapy, and ultimately, a gruelling but life-saving stem-cell transplant. I'm finding this half-marathon goal has really focused my mind on my continuing recovery, and is helping me to learn and respect my body as well as my limitations. I HAVE SO MUCH RESPECT AND GRATITUDE for the people at MSK. Receiving treatment there, and the ongoing support and care that I receive, has taught me so much about the insidiousness of this disease. The higher calling that some people have to do the intense research in the fight against cancer, and the many people I encountered who care so compassionately for the unfortunate innocents who develop it, have left me with an everlasting conviction in my heart. 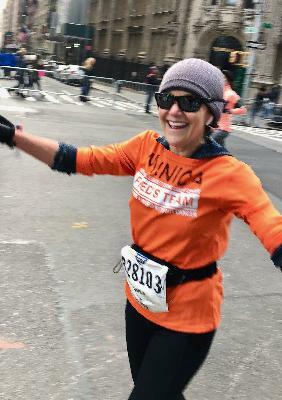 Awesome day yesterday at the NYC 1/2 marathon!! Thank you to all of my supporters! !